PETER’S ARGYLL relates the life of Lance Corporal Lorne Andrew Marr who was killed in action August 27, 1944 at Igoville, France while serving as a dispatch rider for the Argyll & Sutherland Highlanders of Canada. His large extended family was devastated by the news. However, they never knew what exactly happened or how Lorne had met his fate. There were stories told by returning soldiers after the war, but those stories didn’t give them what they wanted to find out. Many years had passed and with the author’s interest to look into what really occurred, things started to come out leading him to fulfill his desire to know more about his unseen uncle. He had seen pictures of him, which bred many questions in his mind. He wanted to know everything, and he wanted to make a difference with his longing. This book tells us of how he uncovered his Uncle’s story and that it was one that needed to be told. This book is a quest for family history. Along this journey of discovery, he had the privilege of meeting various people who helped him understand the events, and complete his account. He was looking for Peter, and when he found him, everything fell into place. 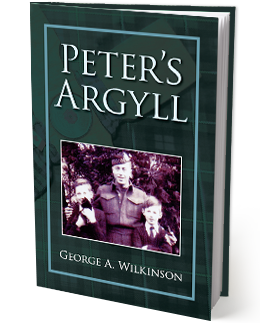 Sixty years in the making, the story of PETER’S ARGYLL is a wonderful tale about a man whose death was never told, whose story was almost forgotten, but now will be shared with everyone. Take this interesting adventure, and find the value of someone in your life!